In this article, we’ll look at how to interface a 315Mhz 4 channels wireless remote control with Arduino UNO. Specifically, we’ll be looking at how to control the inbuilt LED. 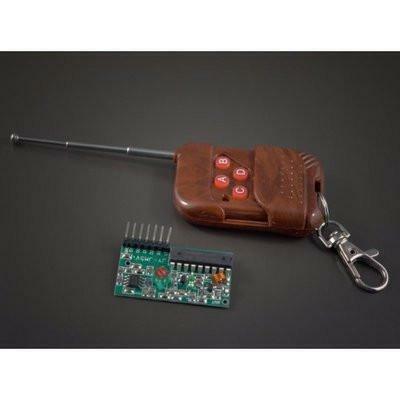 RF modules offer the capability to wireless transmit data on electronic and robotics projects, this modules are extremely easy to use and are quite cheap which make them ideal for projects. The receiver/transmitter uses an IC PT2272. They are commonly used in inexpensive wireless devices to control garage doors, fans, toys and even some alarm systems. These ICs utilize fixed address codes and no encryption so they should not be used for security projects. The transmitter has 4 buttons which activates 4 pins on the receiver module. Start your serial monitor and set the BAUD rate to 9600. Press button 2/4 on the transmitter and watch the Arduino LED turn off. This project can be extended upon. You can incorporate it in the building of a remote controlled robotic vehicle, control your garage door. Let your creativity guide you.